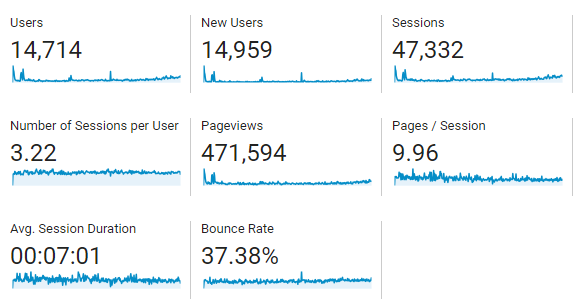 During the past year, the site has served over 470,000 pages across over 47,000 sessions. The site is currently serving up around 12,000 pages a week. It's currently hosting over 2,000 unique images across over 450 pages. PanOceania is the most looked at faction, followed by Nomads, Yu Jing, Haqqislam, Combined Army, Ariadna, Aleph, Mercenaries and then finally Tohaa! I'm happy to say that the site is looking pretty healthy really and there's been a broadly upward trend in visitors over the last couple of months. Users are currently spending about six-and-a-half minutes on the site on average and viewing eight to nine pages. That to me says that word is spreading about the site and that people are still finding it useful, which is great! The biggest change since the inception of the wiki was the addition of troop profiles for all units. This has turned it from a fluff resource and miniature catalogue into something that can be used as a quick reference instead. It was by far the most requested feature when the site first launched and I've had no regrets about making the change. The site is now also fully cross-linked to the Infinity Tactics wiki so you can use the External Links section to hop between the relevant pages for units/factions depending on whether you want background and pretty pictures or strategy tips! Whilst it's a shame that all that info couldn't be consolidated on a single site, I think the Infinity Tactics wiki is great an I'm looking forward to seeing how it does in the long term. Lastly, We've finally stepped into this decade by changing over to the Vector skin, hopefully improving the experience for mobile users. Uprising has absolutely messed up everything, as have the NA2 armies in general really! JSA has been relatively awkward to implement as splitting up factions wasn't something I was planning on having to do. This wasn't helped by the fact that CB don't tend to issue proper change-logs and so occasionally ARMY is updated without a clear indication of what has actually changed and so I've had to rely on various forms of social media to help pick out the differences. The sheer amount of content coming out over the last few weeks has been a little daunting too, with new factions, articles, patches, dossiers and a slew of both Infinity and Aristeia releases. I *think* all the profiles are correct again now, but as always if anything seems wrong or inconsistent then please let me know. I'm looking into using the Cloudflare caching service and/or breaking up bigger pages (e.g. Limited Edition Models) in order to further improve page speeds. Hopefully this will be an unobtrusive change that will make for a better user experience. As part of this, I might move to doing regular monthly updates rather than the ad-hoc method I have currently. At some point I've got to give the site a bit of an overhaul and make it prettier. A proper logo wouldn't hurt either. I'd be interested to know whether people prefer a fairly plain looking wiki, or something a bit flashier? I'm also looking for suggestions on whether people want Aristeia stuff included on the wiki or not? The official Aristeia site is already pretty comprehensive and CB definitely don't release as much material in terms of Dossiers and such. Any thoughts about this are more than welcome as it's currently the least developed part of the wiki, but with alternate art cards and skins coming out this might be worth getting on top of sooner rather than later. Another thing that I'd like feedback on is whether people would like to have 'last known profiles' for discontinued troops - e.g. the various Exrah, old Ko Dali, and more recently removed troops such as the Raiden? I'll be overhauling the 'categories' on the Wiki. My current approach was set up in lieu of making proper sectorial pages, but I don't think the approach is working well. I think I'm going to drop most of the currently set up categories (except for denoting characters, troop types and discontinued profiles) and instead put additional navigation templates in place - one for each faction/sectorial the troop belongs to. Lastly, I'm considering moving 'common' mercs (such as Armand and Warcors) into the troop listing of each faction/sectorial they can fight for, whereas they are currently excluded. Would people be in favour of this or is this unnecessary bloat? There's still plenty to be done on the wiki and there are many aspects that I think could be done better which I'll be working on in the current year. Now that Uprising is fully released, hopefully things will calm down a bit and I'll have time to focus on general site quality and maintenance for a little while. Overall it's been a wildly successful year, more so than I thought it would be, and the site has grown by leaps and bounds. I'm excited to see how it will be doing after its next trip around the sun! As always, many thanks to those that have emailed or messaged me with suggestions, corrections and extra items to include.